The module is designed for use on school buses as required by the RTA. When the doors are opened it activates the module to flash two or four amber lights alternately. The module is designed for the use in school buses as required by the RTA. The module is activated and operates the four amber lamps (which are fitted externally on the bus), when the bus door(s)are opened. These are designed for use on vehicles with negitive earth air pressure switches. 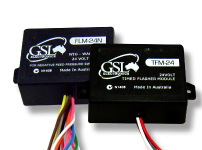 STFM is designed for use on STA vehicles with a positive voltage feed door air pressure switches. This module is designed for use in conjunction with either STFM-24 or TFM-24 or TFM-12 (To flash vehicle headlights alternately).The module is activated and operates only when the timer unit is activated (via the door air pressure switches) and flashes the vehicles headlights (alternately).